Do you have the need for speed? Do you live to push the pedal to the metal? It's time to rev the engine and max the throttle in this lightening-fast motocross challenge. Do you have the need for speed? Do you live to push the pedal to the metal? It's time to rev the engine and max the throttle in this lightening-fast motocross challenge. But there's nothing ordinary about this bike race. In order to get to the checkered flag, you have to navigate through 9 levels of ravaged and war-torn terrain. Be sure to check those rear view mirrors, because you never know what could be chasing you in this apocalyptic, desert landscape. All you need to do is finish the bike race before the punishing desert heat catches up. Combining sleek, realistic graphics with a soundtrack that a mix of heavy metal and gunfire, this motoracing challenge will leave you on the edge of your seat. 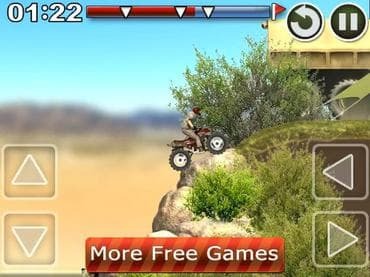 Play desert motocross free today and experience the thrill. If you have questions about Desert Motocross game, please contact us using this form.